Project List - Click on thumbnail for slide show or larger photo. 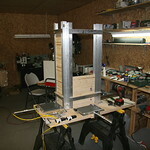 Building a machine to automatically feed, assemble and staple T-stakes for the underground mining industry. This machine can build 8-10 T-stakes per minute. Stake cross pieces are joined with a single staple that's clinched on the underside. This machine has produced about 150k T-stakes since it was installed in 9/2016. Two of these mechanisms were used to support and actuate a dumping out feed table that received wood boards from a rip saw. When the rip is completed, the out feed table will dump the boards onto a conveyor belt and return them to the in feed location. 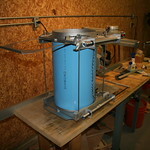 This allows one person to run the ripping operation. Avoiding the need for a tail boy. 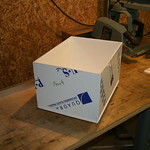 Making a polypropylene (1/4" thick) coolant tank 12"w X 16"l X 9.5"d using thermoplastics (hot air) welding with a filler rod. For weldable plastics, the supplier can provide round filler rod to match the material being welded. The bulk of the labor on a job like this is positioning the parts and holding them in place for welding. Individual panels need to be cut accurately and carefully chamfered for a weld groove. 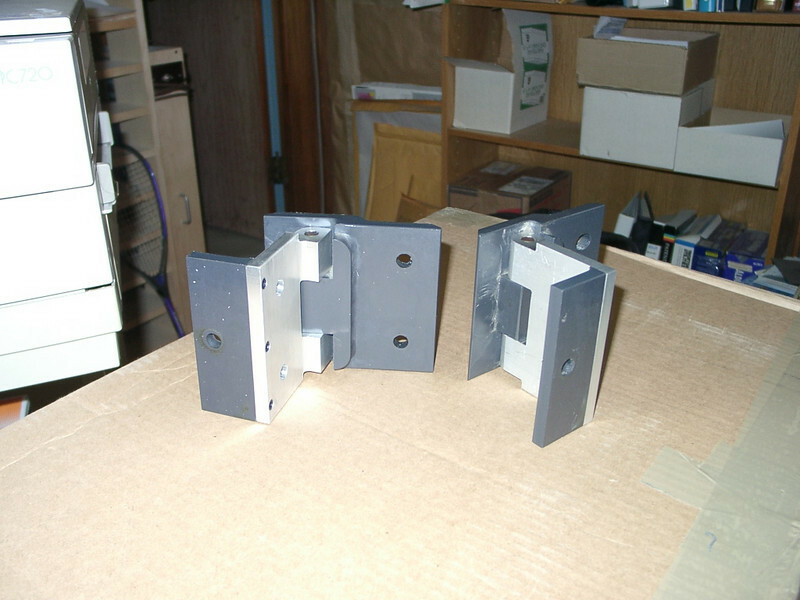 Done properly welded joints can be as strong as the base material and water/air tight. It's a time consuming process to make a tank like this. This airlock allows wood chips to be exhausted in batches without losing large volumes of air. The top blast gate opens first allowing wood chips to fill the chamber. That gates closes then the bottom gate opens to allow the chips to fall into a waste bin. At no time is there any continuous air flowing through the cylinder owing to only one gate at a time being open. 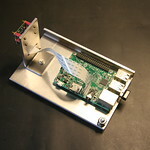 A Raspberry pi board provides the logic and timing. It is remotely controlled through an ethernet cable back to a PC. Raspberry pi 3 model B mounting to include the 1920x1080 HD pi camera. This was used to look at a process and perform a pixel level video analysis to control upstream variables. This project is quite involved. It requires mapping (x,y,z) 3D space into a delta positioner. 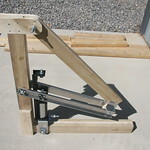 The delta positioner was selected due to its unique geometry. It moves a machine control rod from a joystick and/or canned cycles. Two prototype boards were wire wrapped for the electronics. In later versions, servo motors replaced the stepper motors. Circle step over pattern HERE. 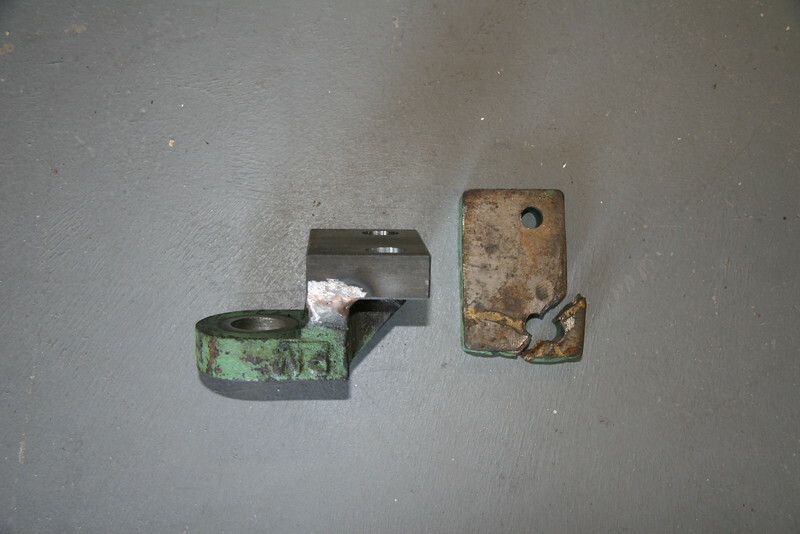 Carriage and brake mechanism for a cutoff saw stop. This will be positioned by a single stepper motor and controlled from a dedicated MCU application. 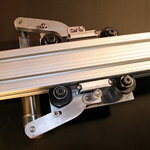 The 1.5" x 3" aluminum extrusion is accurate enough to provide a cost effective linear bearing capable of over 10' of travel. A custom sized aluminum enclosure was made to house this pneumatic brake control. Custom engraved ID plates were made to create durable markings for controls and functions. Air lines run out to the brake cylinder. A set of dry contacts is all that's required to turn braking on or off. 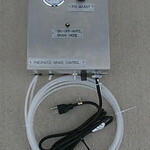 An air line regulator w/pressure gauge adjusts braking pressure. Control wiring is 24 VAC for safety. 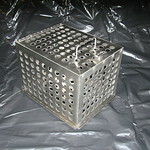 Laboratory containment cage made from 18ga 304 stainless steel w/hinged lid. Dimensions are 13" wide x 12.5 high x 17" deep. Cast iron machine part support foot was broken. 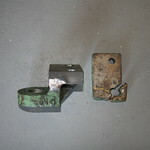 Part was repaired using a silicon bronze TIG welding process. New foot was machined from steel flat stock. Fan assisted vent system covering 30' of attic ridge. A remote temperature sensor and RS-485 communications link is used to control the fans. 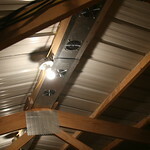 Attic temperature can be reduced to about 90F during hot Summer days. 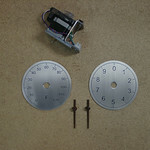 Custom engraved instrument dials for a wall display unit. Pointers were custom made also. 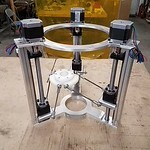 These are controlled via RS-485 equipped 23 frame stepper motors. Dials are about 4" in diameter. 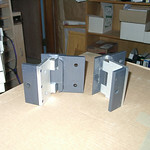 Custom hinges made to replace broken ones for doors on squash courts in local college. Aluminum was used instead of plastic in high stress areas to form a hybrid construction that could handle abuse.